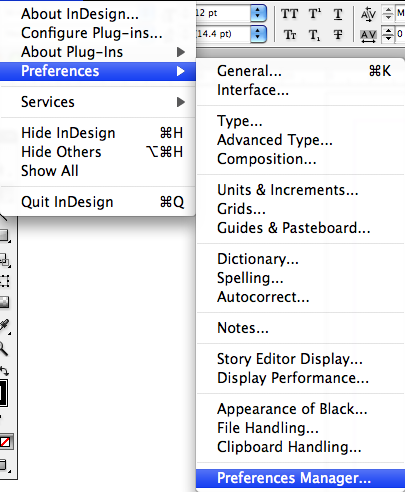 InDesign has an awful lot of preferences which effect many different aspects of the program. To set the preferences the way you want them across machines can be rather tedious. Also, any time you “trash preferences” in InDesign, all your custom settings get lost. Adobe tells us that preferences can be scripted, but that “solution” is a bit beyond the average user (and most advanced users as well!). Preferences Manger is a free CS4/CS5 only script we developed to solve the problem of saving and loading preferences. It offers the ability to save preference sets which can be loaded at any time. You can save different preference sets with settings that you might use under different circumstances as well as save preference sets which can be deployed across different computers. Preference Manager is a start-up script, which means that it is installed in the scripts folder and loads itself when InDesign starts up. The functions of the script are accessed by a menu item which the script creates. To install the script, simply download the script from here, and unzip the file. It will unzip to a folder structure with the top level being called “PreferenceManager”. Move the entire folder into your main Scripts folder as shown in this screen shot. Next, just restart InDesign and a new menu item will appear. To save your current preferences, simply click on “New” and a prompt will show up to allow you to name your preference set, and the script will save your preferences to a file. Once the preference set is saved, it will appear in the list in the dialog. If you would like to open the file and change values, you can select a preference set and click “Edit. This will open the file in the default xml editor on your computer. To delete a preference set file, you can simply click “Delete”. To load a preference set, select the set which you want to load and click “Load Prefs”. If no document is open, the default preferences will be changed. If there are open documents, the preferences for the front-most document will be changed. In the PreferenceManager folder, there is a sub-folder named “Default Sets”. Any preference set files placed in this folder will appear in the list for all users. The script comes with two sets which can be used: “International Defaults” and “US Defaults”. You can use these default preferences, change them, or delete them as you wish. The default location where Preferences Manager saves the preference sets is in the user application data folder. 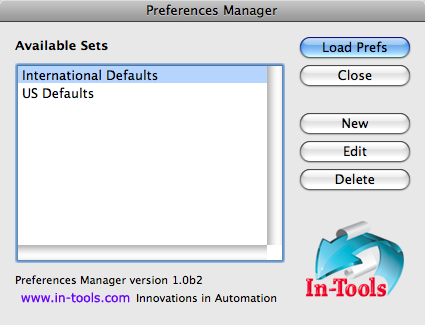 A folder named In-Tools will be created, and a sub-folder named Preference Sets will be created inside the In-Tools folder. All preference set files will be stored there, and be available to the current user. If you would like your sets to be available to all users, you will need to move the files to the Default Set folder location. Preferences Manager should save and load just about all preferences. Some preferences can effect the appearance of your documents (such as “Skip by Leading”, “Text Wrap Affects Text Below”, “Justify Text Next to Objects”, and many others). You must be very careful when you load preferences on existing documents that you don’t adversely change the appearance of your documents! The current version of Preferences Manager only saves and loads preferences. It will not save or load any presets (such as printer presets, pdf export presets, transparency, etc.). Nor will it save or load any styles or swatches. Harbs, I love it! Congratulations and many thanks! And I enjoyed the discussions on the idea, too. Oh, yes! This’ll come in real handy. Thanks for writing the script, Harbs, and many thanks for making it available for download. I’d like to suggest adding the ability for users to choose a storage location for their old prefs files, and/or the ability to use Windows file shortcuts and Mac aliases. My thought is that users who do backups (everyone, right? ) probably backup their user data file locations, but they don’t always back up applications or application support folders/files. That’s a good idea to make the location user definable. Shortcuts and aliases should work as it is (although nested folders will not). In terms of backups: The default location is in the user application data folder, and under normal circumstances, should be backed up along with the rest of a user’s data. I tried downloading this script twice-thrice, but seems to be corrupted. Any idears. I tried downloading on both Mac and Windows. It downloads and expands fine. What kind of error do you get? I belive I need to download file from here “To install the script, simply download the script from here, and unzip the file”. I have downloaded and installed successfully, and the app allows me to create a new Prefence File, but the XML data file is empty, so no preferences have been saved it seems, and there is nothing to edit. Really like the sound of this… would like it to work. Win XP. Thanks, Felix. I don’t know why the xml file would be empty, but if you’d like to try to help track down the problem, you can contact tech support. Thank you. This is excellent. I am missing an option to load a pref file at start-up, though. Great idea! When we work on improvements, we’ll try to include that option. Is there any news of this for CS5? tested it a bit with CS5. Seems to work with the Preferences available in CS5. As expected it will not save and restore preferences not available in CS4 like the dynamic sreen redraw (i do not have an english version, so I tried a basic translation). Is there a change to get the code of the script to expand it like an open source project? I just updated the script to harvest the new preference categories available in CS5. 1) Clear Overrides When Applying Style. If you find any other preferences which don’t get preserved, please let me know! Just installed and quickly tested this in CS5, seems to work fine. Great script, thanks! This is a great tool. Thanks! What do the numbers mean? If I wanted RGB for my transparency blend space do I need a numerical code? If so, where would I get the code? I was wondering when customizing the settings if it is ok to make comments in the xml file? If it is ok, which form should I use? clicking either yes or no results in the script quiting. Never mind, I had removed several of the default Windows 7 fonts. When I reloaded them, it all worked fine. Don’t suppose this script could be converted or made to run for ye olde CS3? No. Unfortunately it relies on some scripting features introduced in CS4 that prevents it from being backwards compatible. will there be a version for CS6? I’m trying to save in a profile the “Preference” “Dictionnary” “Language”…. Basically I’m trying to make a startup script that would set this setting to a specific value….. any idea ? Avez-vous une mise à jour pour insegn CC2015? There’s no update, but it might just work as-is. Have you tried?